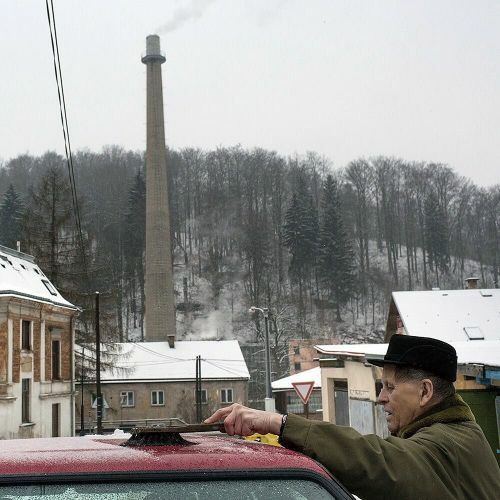 "A man cleaned snow off his car in Desna, a #Czech mountain village. A company here called Preciosa Ornela — the chief employer in this village of 3,000 people — claims to be the world's largest producer of high-end glass beads. Since Czech artisans brought back the secrets of glassmaking from the Venetian island of Murano more than 4 centuries ago, the narrow and tree-choked valleys of northern Bohemia have been producing a dizzying array of beads. Preciosa sells to the Masai and Samburu tribes in Kenya and Tanzania, and to the Zulus, Xhosas, Ndebele and other tribes of southern Africa. In North America, the largest market is for home hobbyists, but several Native American tribes also buy the beads for higher-end pieces aimed at collectors and flush tourists. @urielsinai photographed the town of Desna while on #nytassignment." By nytimes on Instagram.